How should a new user approach Dramatica? First and foremost, Dramatica is a theory of story. The software serves to implement aspects of the theory in a handy and practical manner. Personally, I feel that a writer using Dramatica solely to create a blueprint for a story is missing a big part of the power of the theory. As one becomes more and more familiar with aspects of the theory, these new concepts begin to take hold in a writer's mind at a subconscious level - right where his or her creativity springs forth. In a sense, the theory explanations become subliminal patterns of thought in the author's mind that fine tune his or her writer's instincts, help him or her avoid holes in the story's logic and feeling, and offer a way around writer's blocks. The Dramatica software can be thought of as "training wheels" in the craft of writing. When one is up to speed, the wheels can come off. Unlike riding a bike, however, one DOES forget how, in the craft of writing. This occurs because every day we assume new and different givens, become accustomed and conditioned to new ideas and environments, and as a result we lose touch with how others might view our work. If our intent is to communicate and to move our audience to feel specifically what we have in mind for their hearts, we must hone our skills in getting the message across. That's where the Dramatica software comes in. Both Dramatica Writer's DreamKit and Dramatica Pro come with a special book called the StoryGuide. This book is designed to get new users up to speed with the theory while creating a complete scene order or chapter order treatment for a story along the way. Buy using the workbook along with a special pathway in the software, the new user can put the theory to work immediately and get to know the software at the same time. Once this path has been taken the first time, most writers will want to chart their own path through Dramatica, tailoring their use of the software tool to match their personal writing styles. The way I use the software myself is as a periodic tune-up. I like to write the first draft of a work without using the software. Then, I go into the software and fill in all the storytelling information first. Next, I go to the Storyforming section, click the "storytelling" button and make my Storyforming choices based on what I read on the screen of my own storytelling. I don't go through the lists in order, but rather start with the dramatic items of most importance to me in this particular story. That way, when I finally get down to storytelling I've done that doesn't fit ANY of the available Storyforming choices, it is usually not a pet concept, and I can alter my storytelling approach to fit the overall argument of my story. Finally, when I have arrived at a complete Storyform and brought my storytelling into line, I add any additional storytelling for Storyforming items I had not addressed in my first draft. I then print out the "kitchen sink" report for a record of my ENTIRE Storyform, and use that as a reference while I write. During the original writing process and the re-writing process then, I don't actually use Dramatica at all. I prefer to follow my instincts, once they know where they are going. For the first draft, I don't want to be hindered by analysis, no matter how accurate the feedback may be. Then, between drafts, I want to hear what Dramatica has to say. And finally, during the re-write, I again want to go with my now-refined instincts, and only refer to the "kitchen sink" report when I am at a loss. In this manner, I retain the immediacy and serendipity of my work, and still take advantage of the unique insights provided by Dramatica which keep my work honest for the audience. 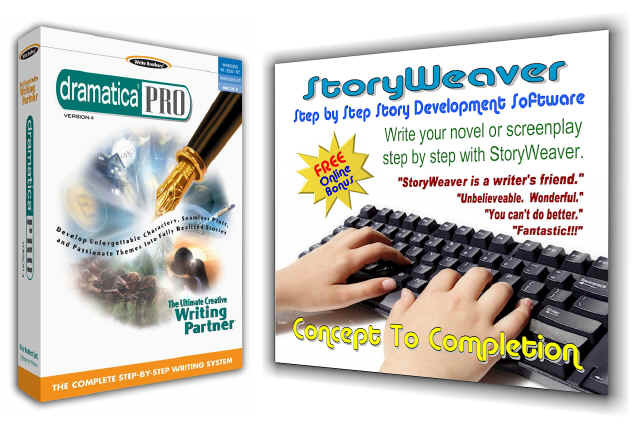 The StoryGuide system that comes as a separate book with the software was designed to familiarize novice writers with many useful concepts in the Dramatica theory that should have an immediate positive impact on their skills. It is my hope that once a writer's creative feet are wet, he or she will wade out a little farther toward the deep water, leave the floats behind and take the plunge into his or her own inspirations. When one feels the currents pulling one out to sea, however, that is when Dramatica can throw out a life preserver and help you find your way back to shore. Well, I wax poetic. Sorry! Just my muse pulling me around by the nose. In any event, thank you again for your question, and I wish you the best of luck in your writing projects, hoping Dramatica proves to be the positive and powerful writing tool you're looking for.